I have a 2009 Smart Car and I am having some abs issues. ABS light comes on and off under 55mph and constantly on after 55. I feel the abs kicking in during braking as well. The car came with 15 inch wheels in the front and 16 inch wheels in the back. Tire Sizes Front = 175/55/15 Rear = 205/50/16. Diameters are 22.58 in the front and 24.07 in the rear making it a 6.6% difference. The brabus has 175/55/15 in the front and 215/35/17 in the rear making it a 5.3% difference. My question is....what tire size should I run? I have 4 brand new (less than 200 miles) on the tires on the car now. I am thinking about swapping the rears out to make the percentage difference as close as possible. obviously, I would want to make the percentage close as possible but they do not make a hancook in the 215/40/16 and I like to try to keep the same brand tires if I can. Any input would be Awesome. Thanks again. I thought of that too but I'm afraid of rubbing. Does anyone on here have any input? if I ran a 175/65/15 in the front, I would have a 23.96 inch diameter. I just got a winter set for a 453 and summer and winter sets for a 450 and the 185 55 15 fits in front of the 450 and the 450 front is the smallest wheel well of them all. Thanks for the info. I appreciate the help. Now since I’m going to be running the 205/50/16 in the back and if I run a 185/60/15 in the front, the diameters are a 1.6% difference. Will that trigger the abs to come on at highway speeds or should I be good? 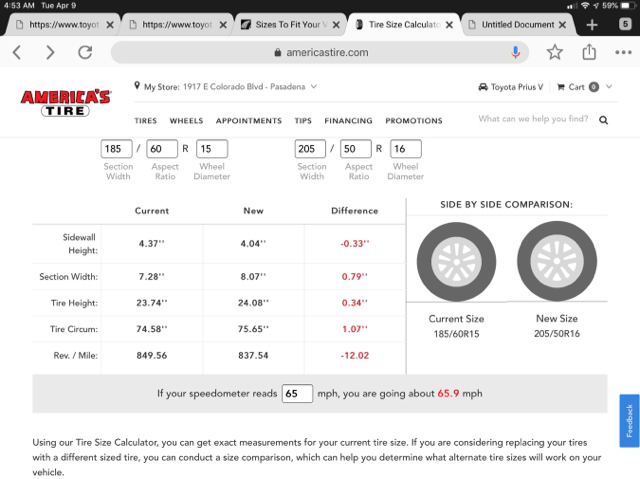 I’m honestly not sure, I could find extremely close diameters if your tires are worn and you are ready to change both front and rear,but given changing front or rear, quite limited. This is a snap shot of original tire sizes from smart, and the 185/60R15 and 205/50R16 combo. 65 - 65.8 and 65 - 64.7, if that makes sense, (it’s how I gauged a staggered setup), as those came direct from smart on various wheels offered by smart.